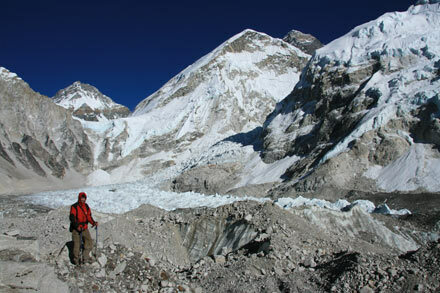 To trek to Everest South Base Camp, or not to trek… that is the question. 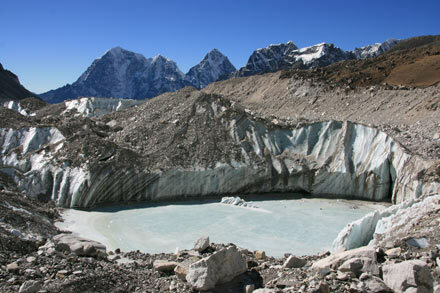 Several guidebooks seem to suggest that a trip to the world-famous base camp is often a disappointment to visitors, especially since Everest is not visible from the site. HOW JADED CAN PEOPLE BE? The walk is spectacular! True, it is a bit tiring climbing through hours of glacial rubble, but the other-worldly landscape littered with massive chunks of ice and frozen lakes makes you feel like you are walking on one of Jupiter’s moons. 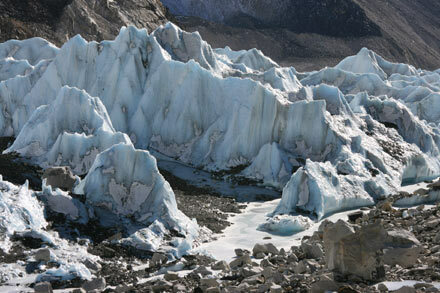 The walk ends at the phenomenal Khumbu Icefall, the starting point for Everest climbers. It’s hard to imagine that passing the icefall is just the beginning for those trying to summit Everest. The sheer thought of walking over the deep crevices sent chills down my spine. Yikes! The site of the base camp itself is also quite interesting because it is so incredibly uncomfortable looking. Between the lakes of ice, the boulders, and the glacial crevices, the ground is covered with large rocks – not ideal for pitching tents! Climbers have stacked rocks into roughly formed tables and benches as well as tent platforms in an attempt to make the site more livable, but clearly a stay at Everest Base Camp would be anything but cosy. Unfortunately, the climbing season was well over by the time we visited, but I would love to see this place alive with activity. We’ll have to save that for the next visit. Also, check out Everest from the North Base Camp. Just discovered your blog. 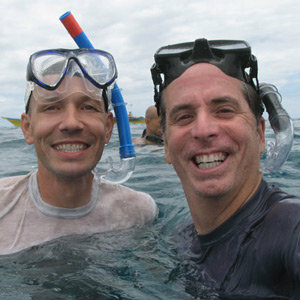 You two have a unique vantage point of traveling! 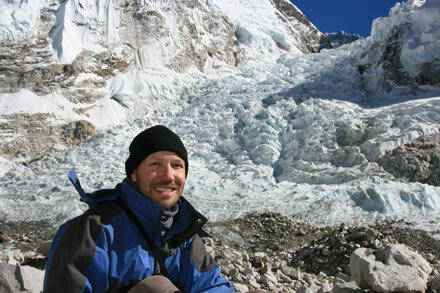 Going to the Everest base camp is something I never would have considered, but I like the sounds of it now. I agree, that it would be really awesome to see it when people are climbing the mountain! If you get a chance, do you have any site recommendations that talk about pricing and how long the trek to the base camp takes? I am interested now. Happy Traveling! Sorry, we don’t really have a good recommendation for a link to a site with current trekking prices. Things change super fast and there are many variables like how fast you want to go, whether you take a guide or porter, etc. Many people do a straight trek from Lukla to base camp and back in about two weeks give or take a day, but if you have the time I would spend a few extra days to take in the Gokyo Valley which many people consider even more beautiful than the area around base camp. It is best not to rush because of altitude sickness.